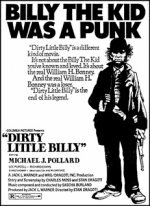 Rarely has a myth been so muddied as that of Billy the Kid in this early revisionist western, in which the lad is seen before notoriety gave him outlaw celebrity. Director Stan Dragoti's often surreal visuals mesmerise, with Coffeyville, Kansas seen as a slop-bucket community from which Billy is only too happy to escape. The fictionalised antihero of the Wild West is played here by Michael J Pollard, Warren Beatty and Faye Dunaway's sidekick in Bonnie and Clyde, as a mentally challenged eccentric, which tends to subtract some sympathy from his situation. This is probably nearer the truth of the period than the legend, which is why John Ford would have hated Dirty Little Billy.